The project also involved a shift from a constant-flow strategy to a variable-flow approach, resulting in a more streamlined and effective method for delivering as much as 14,200 tons of chilled water to the sprawling campus, said Penn State Health Campus Energy Engineer Kevin Kanoff, C.E.M. 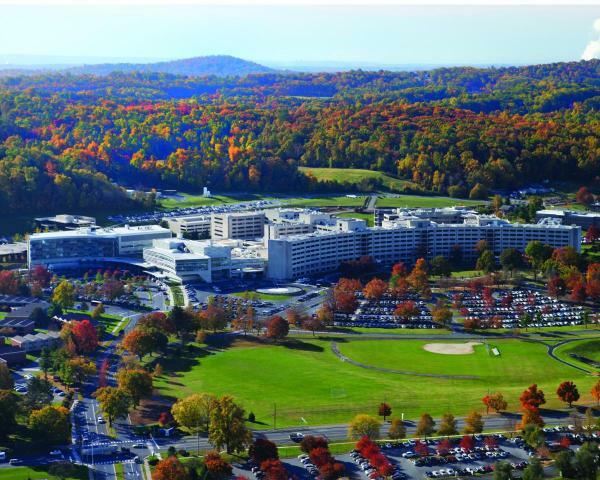 The Milton S. Hershey Medical Center (www.pennstatehealth.org) serves more than 1.2 million patients and employs 10,000 people. The campus includes two hospitals, five institutes, and Penn State College of Medicine. Annual energy consumption at Hershey Medical Center is approximately 112,000,000 kWh of electricity and 573,000 mmbtu of natural gas. 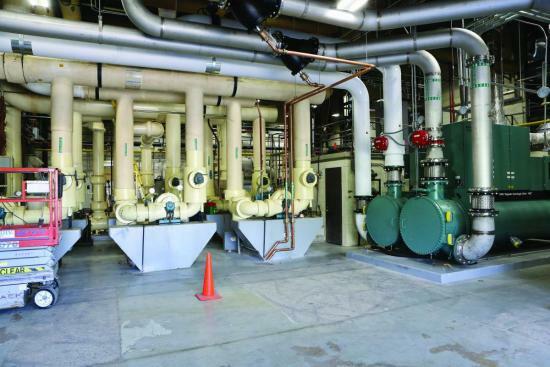 Three chiller plants serve 2.6 million square feet of air-conditioned building space. The chiller operations include a central plant that uses eight chillers and two satellite plants with two chillers each, all of which combine to provide a total of 14,200 tons of cooling. The system also includes a 1.4 million gallon chilled-water storage tank and four cooling towers. Chilled water production totals 24.8 million ton-hours. In all, 12 operators manage the chiller plants. The Milton S. Hershey Medical Center’s central chiller plant. The chiller optimization project is one component of a multiphase energy efficiency program that began in 2009. By 2015, the energy efficiency program had reduced the campus’ energy intensity by 20%. Yet Kanoff always knew more could be done to further improve the efficiencies of the chiller plants. “We’re always looking at our energy use and it’s very obvious that chilled water production is a major energy user. We know our operators always do a good job and we have always had good operating strategies, but we had inklings there were good opportunities for improvement in energy efficiency,” Kanoff said. With plans to address chilled water production in place, Kanoff launched the optimization project in multiple phases to take the efficiencies of the chiller plants to a new level. During the first phase, Optimum Energy (www.optimumenergyco.com) performed an engineering site assessment that showed the medical center could gain additional energy savings. 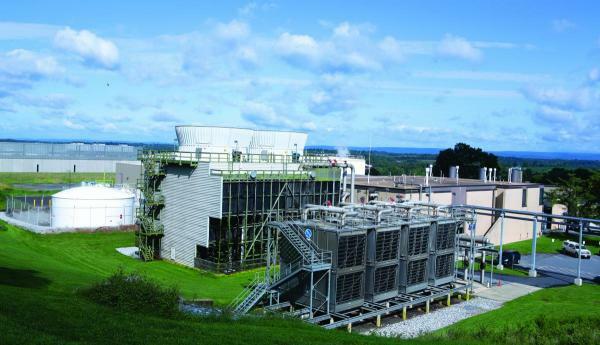 At that point, Johnson Controls – as Hershey Medical Center’s lead vendor – installed Variable Speed Drives (VSDs) on the central plants’ pumps and fans. Johnson Controls (www.johnsoncontrols.com) also added power meters and sensors to the equipment for precise measurement of all system components, and fully automated the plant. 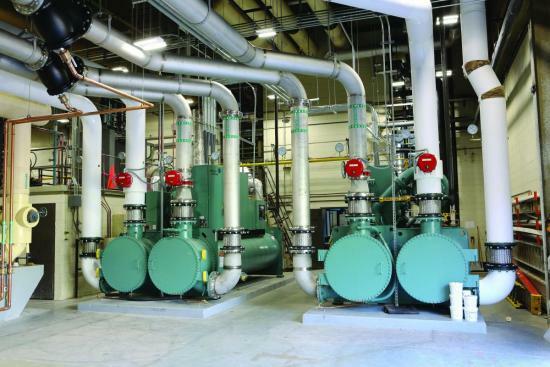 The medical center’s central chiller plant leverages pumps with VSDs (center) to achieve energy efficiencies. Next, Optimum Energy installed its OptiCx™ platform, which seamlessly optimizes all aspects of enterprise-grade HVAC, including chilled water plants and air-handling systems. In all, Hershey Medical Center uses 155 air handlers. Recognizing that security of data systems is a high priority for a medical facility, Optimum Energy worked closely with the center’s IT staff to ensure all data going from the plant in Hershey to Optimum Energy’s cloud-based platform would be absolutely secure. Optimum Energy also combined the data analytics of the OptiCx solution with its OptimumLOOP™ relational control to optimize the plant holistically. It automatically stages all the chillers and the chilled-water storage tank as an integrated whole, choosing the best option based on equipment efficiency and demand for cooling. To do so, the software continuously collects data about plant operations, outside conditions, and hundreds of other parameters, and calculates how to operate for peak efficiency and operational stability. It then adjusts the set points of pumps, fans, and other components in real time. “The system finds the sweet spots in operating efficiencies for the pumps, chillers, and towers, etc., and determines where the best efficiency is to meet that particular demand in gallons per minute at that moment in time,” Kanoff said, adding that the system controls the entire operation with plant operators’ oversight. Optimum Energy completed the installation of its optimization and analytics platform in June 2016. The optimization effort streamlined chiller operations that staff had performed manually without a complete picture of the system. The switch to a variable-flow approach and the adoption of an automated system required a new mindset, said Kanoff. “The team still monitors the chillers and verifies the data, but now they do it with OptimumLOOP,” he said, noting the approach called for facility operators to gain familiarity with the new system. “They had to watch the how the equipment performed and live with the system for a while to realize how the optimization strategy works to provide chilled water in an efficient way. Now, we’re not managing things on the edge or our seats. Instead, our operators have better tools to manage chilled water production and can do it with less stress,” Kanoff said. Another element of the strategy included the replacement of two aging centrifugal chillers at the central chiller plant with magnetic-bearing centrifugal chillers, each of which is rated to deliver 1,000 tons of cooling. The new chillers were installed in the winter of 2017 in keeping with the operation’s end-of-life equipment replacement program. Magnetic bearing centrifugal chillers at the central chiller plant. bearing centrifugal chillers at the central chiller plant. The new approach exceeded expectations for energy savings and resource efficiencies. Annual energy savings associated with the software platform and analytics solution were found to be almost 4.2 GWh/yr, roughly 1 GWh/yr more than expected, and campus energy intensity dropped 4%. The results are in addition to the 20% reduction in energy intensity achieved earlier, bringing the campus-wide reduction to 24 percent over 2009 levels. “We initially projected an energy savings of 3.4 GWh annually, but the electric utility’s evaluator found that savings are actually 4.16 GWh annually,” says Kanoff. That translates into electricity costs savings of about $300,000 a year; he originally projected that the system would save $261,000 a year. As a bonus, Hershey Medical Center earned a onetime $416,000 incentive from the utility. Kanoff is also pleased with efficiencies of the chiller plants. Annual average plant-wide efficiency is now 0.646 kW/ton, which compares with 0.828 kW/ton before the optimization project. Additionally, the project has allowed Hershey Medical Center to significantly decrease its carbon footprint. In total, it saved 7 million pounds of CO2 emissions through March 2017. It also saves more than 1.4 million gallons of water per year as a result of the reduced energy consumption. Following completion, the project garnered the U.S. Green Building Council’s Central Pennsylvania Forever Green award. For more information about Optimum Energy’s OptiCx platform visit www.optimumenergyco.com. To read similar Cooling System Assessment articles please visit http://coolingbestpractices.com/system-assessments/cooling-controls.